CLONE played live at the small art gallery alongside Radioactive Sago Project, Drip and Wahijuara. Ria Mariano made her debut with the group in the 35 minute vocal set. CLONE played live alien music tinged with sci-fi samples at the sci-fi con. There were people in costume (Alien, Borg, X-men), there were booths selling toys, books, games, videos, and more merchandise. There was the screening of Star Trek: Nemesis. And amidst all the geekery, CLONE felt right at home! 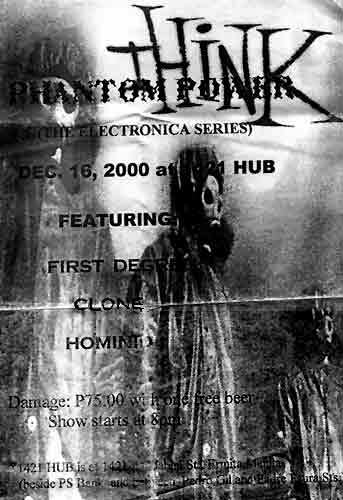 CLONE was the 6th of 6 performers, including Huh? Alkoholokaust, and 3dayMarathon. We were the cyberpunks after all the punk bands finished. Joining us onstage was Armand Quimpo on guitar. This was also the day we finished the "Answer the Plunderphone" E.P. so we played the fresh material: all at 160 bpm and preoceeded to overload the speakers. This was the post-new year electronic music party for Indiefilipino.com and Brash Young Cinema and friends. In a totally D.I.Y. move, we brought 3 amplifiers and our mixer and our gear. Instant rave. It was an early evening downtempo groove thing, with an incorporated poetry jam. A whole bunch of people brought their verses and read 'em out while CLONE performed downtempo backing music. Guest vocalist at this gig singing "Cry" was Ria Mariano. At the semi-monthly recital, CLONE finally decided to show up as a group and play as an instrumental duo. No MIDI sync, no plans. Instant jam. The activity was organized by The Friday Exchange, in tandem with Crossroads77, a progressive Christian church in Quezon City. CLONE had a 45-minute all-dance set in between DJ Ann Barcelona and another DJ from BigFish, TC. There was a collaboration with two Exchange artists, Goya Bulahan on vocals and Em, a keyboardist who played trance on his Korg keyboard/sequencer. This was an untitled electronic recital for Karlo, now called LONE. Clone's second time at the Music Museum was actually a learning experience for all. First lesson: don't go to a wedding right before the gig. It harries your nerves. Second lesson: don't drive on through your set without a proper sound check-- even if you must sacrifice your first song as the sound check. Despite problems however, the group (rejoined by founder/drummer Andre Quimpo), did three songs, "Vigil", "Presence" and "Nothing Yet" to an audience that was more primed for the eclectic indie/prog rock that the other bands played that night. Clone's resident samplist and funnyman Karlo Samson took the stage solo beside five other performers... for an electronic recital at Kemistry. He played a straightforward piece entitled "Rocket Summer" inspired by Ray Bradbury's The Martian Chronicles. Lionel and Sheerin were there to cheer him on. This was Clone's first time to play in a church setting, though the place was arranged for a weekend expo of sorts: booths were at the sides, surrounding the main stage where a variety of mainly pop groups performed. Except for CLONE. ___ The Friday night show, Clone played at around 10:30 pm, after the rousing pastor's speech about how Beethoven and Bach were considered cutting edge in their day, and how we must change and embrace the new... or die. The crowd, surprisingly was primarily younger than 30 and quite open to the music, especially since the band made it clear they were drawing from liturgical themes. This also marked the group's first reunion gig with Andre Quimpo. ___ On Saturday, Clone performed at around 5:30 pm and was unfortunately without Sheerin's vocals once again. Karlo, Lionel and Andre managed to turn this around however by playing more instrumentals than songs requiring vocals and sacrificing audience impact for emotional honesty. It's interesting to note that right after Clone, acid jazz stalwarts Parliament Syndicate played. Once again, the regular electronicfest, this time the line up had only Clone, First Degree and screaming rockers Loss Of Control. This gig marked the first major performance without vocalist Sheerin. Lionel took over vocal duties and the group performed as a duo that night. ___ Since Synactix could not make it, a spontaneous jam session ensued with Clone and First Degree teaming up for the first time. It was agreed that the jam session should be repeated in the near future. Organized by Synactix' Marck Laccay, this monthly electronica-fest hosted Clone along with other unsigned, underground acts in Metro Manila including: Synactix, First Degree, and Rumblebelly. Part of the Lava Lounge weekly live gig, Clone performed two complete sets with a kaboodle of supporters and curious walk-ins present. The band's trip-hop/nuovo-lounge sound blended in perfectly with the bar's ambience. This was the band's first time in a bar setting. This one was arranged so that on the main stage outside, electronic duo Rubber Inc spat out their aggressive bubbly brew of techno while inside the Lounge, Clone cooled off the audience with their midtempo vibes. Two full sets. The band filled the lounge with their friends so everything was warm and toasty and all the music was appreciated. At the anniversary of mainstream entertainment magazine, Channels, the band played a tight set to a crowd of head-scratching advertisers and press people. The performance was a rousing one nevertheless, and the band made do with the limited time to impress its electronic agenda on the unsuspecting crowd. Clone is proud that they got an exchange deal as payment. They went home with brand-new CD players. Along with techno bands Synactix & First Degree, Clone put up a show that allowed their voices to be heard a bit more. The Music Museum gig was the first performance for newly-recruited vocalist Sheerin Castillo and her trial by fire. Unfortunately, Andre could not make it for the gig. But all in all, it was an excellent start for the new line-up. Once again at the art venue, CLONE teamed up with electronic-rockers First Degree for a night of music that was half-performance and half-practice. Experimentation was key. The band got paid PhP 30.00. That was 10 pesos each. It was a proud moment for each of them...and they're not kidding! The band's debut performances as an instrumental unit, initially as a duo with Lionel on keyboards and Andre Quimpo on drums and the occasional keyboards. Later on as a trio with Karlo on samplers and keyboards and Andre solely on drums & percussions. The audience present were primarily underground musicians and bands. Clone started out as a solo unit (Lionel), providing background music for a poetry night at the art cafe in QC. The invitation by cafe owner Khavn dela Cruz provided the catalyst for seeking more musicians to collaborate with.